The harami cross pattern can be considered a major reversal pattern. It is better at calling tops than bottoms. In this case, it shows an attempt for WTI to hold above support of $38 a barrel. Not a time to be long or short. Wait for the next move. 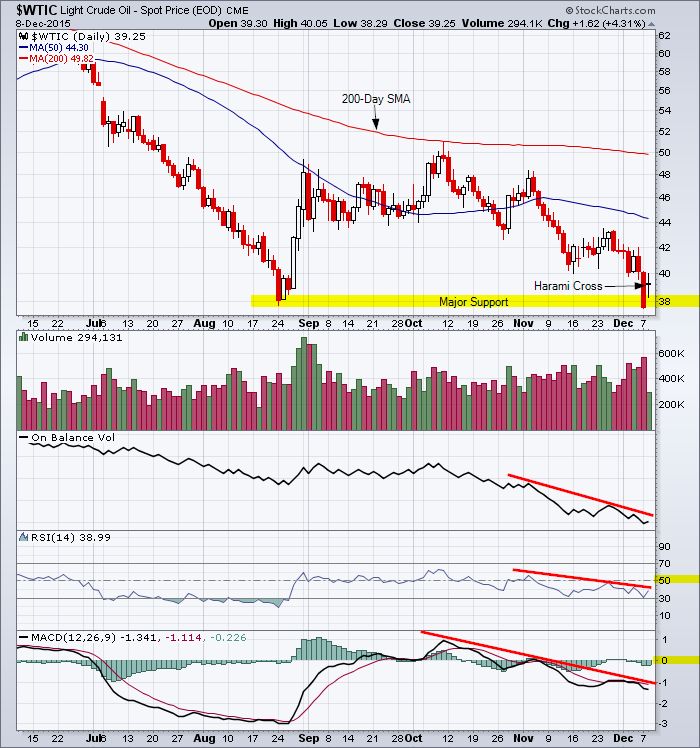 Reference the last chart analysis for West Texas Intermediate. This entry was posted in Other Topics, U.S. Indexes and tagged candlestick chart, harami, WTI on December 8, 2015 by Trader. I start each trading week with an analysis of the major US and Canadian indexes. A three year weekly candlestick chart is my tool of choice. Three simple moving averages (50 day, 100 day and 200 day) are used to monitor the trend and any crossovers. Volume, On Balance Volume (OBV) and Relative Strength Index (RSI) are used as confirming indicators and to spot divergence. The harami candlestick pattern identified on the above chart of the TSX Index is similar to the Western inside day. This is not a major reversal pattern but caution is advised. The TSX Index may move into a consolidation range between support and resistance. But a break below support of 12,500 would be reason enough to liquidate selected long position. 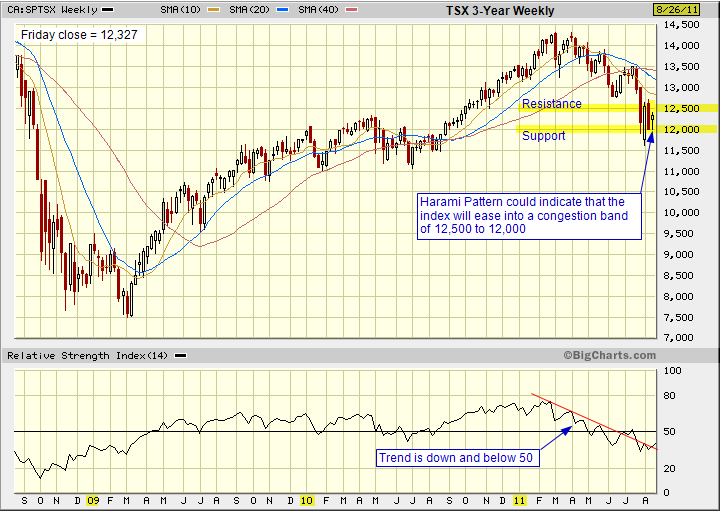 Reference last weeks analysis of the TSX Index which highlighted the confirmed breakout above resistance of 12,500. This entry was posted in TSX Index and tagged candlestick chart, harami, Technical Analysis, TSX on March 4, 2012 by Trader. The intermediate trend is down and the near-term trend is sideways. Reference the last chart analysis for the index. Please leave a comment to suggest a stock or index for analysis on this site. This entry was posted in TSX Index and tagged candlestick chart, chart analysis, harami, resistance, support, TSX, tweezers top on November 4, 2011 by Trader. 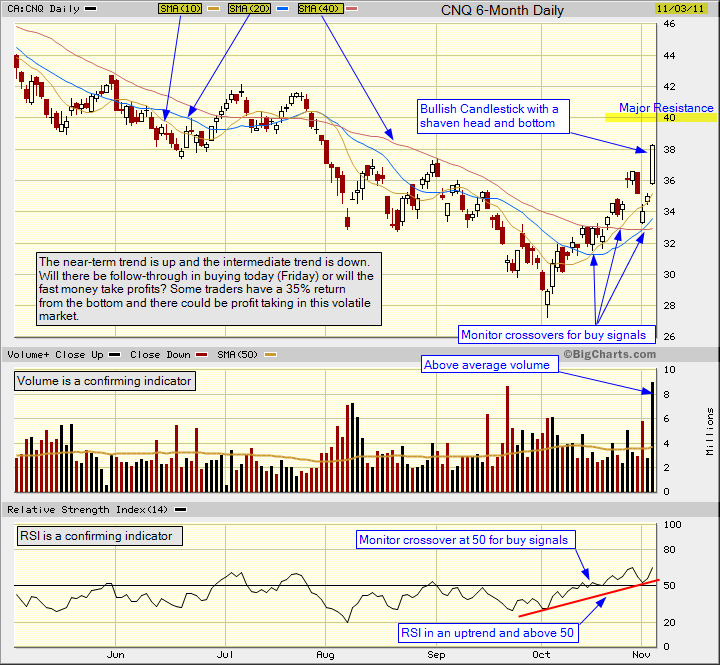 The above candlestick chart highlights the bullish candlestick for Thursday, Nov 3, 2011. I always look for follow-through after a tall bullish white candlestick. But you have to analyze individual company charts in the context of the overall market. And in this volatile market nimble traders will take profits on near-term gains. Major resistance of $40.00 is around the 200-day simple moving average which can be seen on a weekly chart. 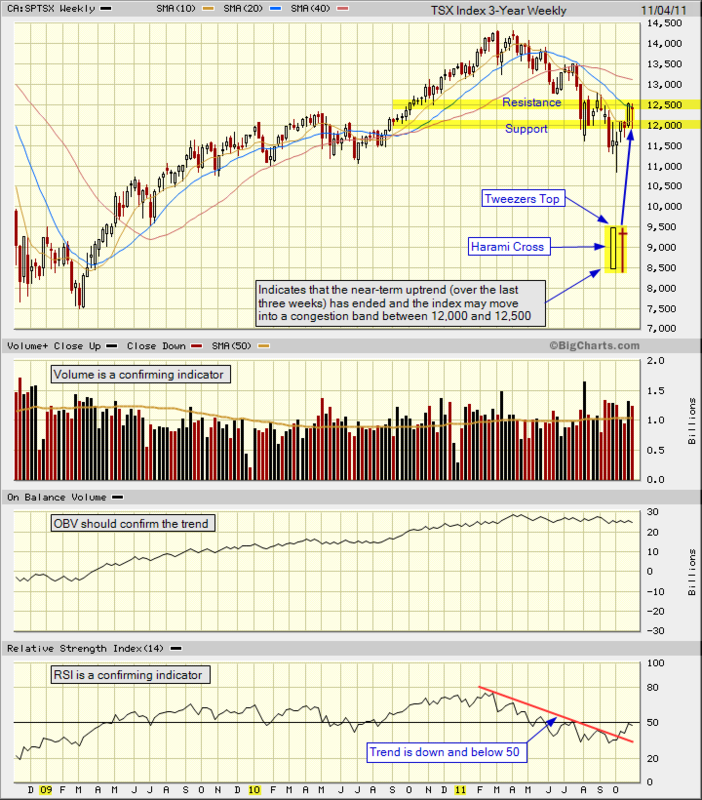 The chart to the right is a snippet from the daily chart for Friday, Nov 4, 2011. 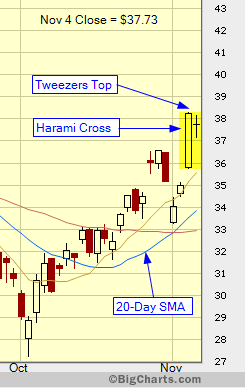 The harami cross candlestick pattern in combination with a tweezers top could be an indicator of a reversal in the near-term uptrend. The bulls did on persevere on Friday. Reference the last chart analysis for Canadian Natural Resources. Reference the website for Canadian Natural Resources to review the fundamental data. The main purpose of TradeOnline.ca is a starting point for your own analysis. Technical analysis serves as a guidepost in your daily investment analysis and is used in conjunction with fundamental analysis. There is no magic formula for making profits in the stock market. We are all students of the market, and one should never give up reviewing and learning the basics. Visit the Advanced Chart Settings and customize BigCharts so you can review different time periods. 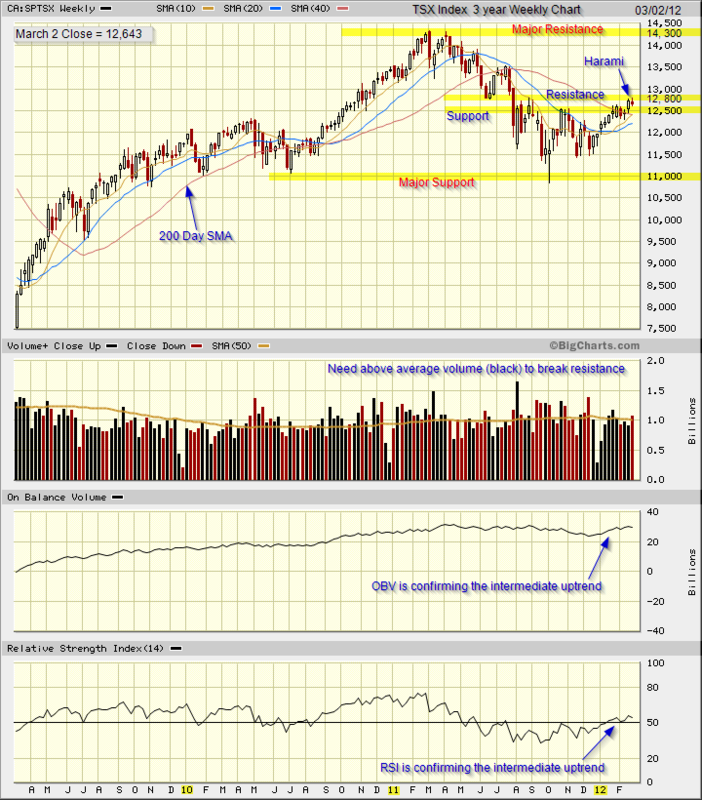 This entry was posted in Stocks and tagged Bullish Candlestick, chart analysis, CNQ, harami, near-term trend, resistance, support on November 3, 2011 by Trader. We may have a bottom in the recent sell-off but the intermediate trend is still down. Cash is king in this market. Reference the previous analysis of the TSX Index for the downside risk if the index cannot hold the 12,000 and 11,500 support levels. This entry was posted in TSX Index and tagged candlestick charts, harami, major support, resistance, TSX on August 29, 2011 by Trader.